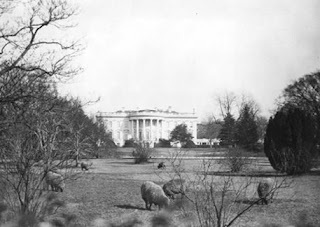 Photo (US Library of Congress): 1918, Woodrow Wilson's White House Lawn, Baaa! Are you ready for a White House farm? The 1600 Pennsylvania Avenue Farmers Market? Only 11 days into the new administration and Michelle Obama has recruited their locavore personal chef from Chicago, Sam Kass, to join the culinary team of Executive Chef Cristeta Comerford at the White House. 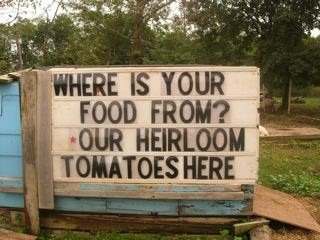 That's great news for locavores and Maryland and Virginia farmers and DC farmers markets. THANK YOU FIRST LADY and LOCAVORE MICHELLE OBAMA!! (I suspect Mrs. Obama read Michael Pollan's letter to President-Elect "Farmer in Chief", The New York Times, October 9, 2008 ). Rumor has it, last fall President Obama said he read it. According to Marion Burros at The New York Times, Mr. Kass and his Inevitable Table home chef service is dedicated to local and sustainable food. Kass' vision and philosophy is spelled out (thanks to cache I was able to get these excerpts from his recently shutdown website). "Inevitable Table is your link to clean, healthy food.....we improve your health, bring pleasure to your table and connect you to your food community." "we share our understanding of how food can improve our health, increase our energy, and connect us with our land and local community in a sustainable way. With our support, the table once again claims a central place in the home, enriching our bodies, lives and relationships." "we source basic grocery items mainly from local farms such as milk, eggs, bread, etc." "Through our partnerships with small sustainable wineries"
Frisee salad, cashews, pickled red onions, apples.